Will Smith has shared the screen with all manner of robots, aliens, zombies and other beings… and his characters tend to deal with them by shooting them, punching them or blowing them up (usually followed by a clever catchphrase). But Will Smith the actor has never really tried an alternate strategy — like, for example, putting his slickest romantic moves on them. Until recently, that is, when the actor scored a date with Hanson Robotics’ famous (some would say infamous) A.I. 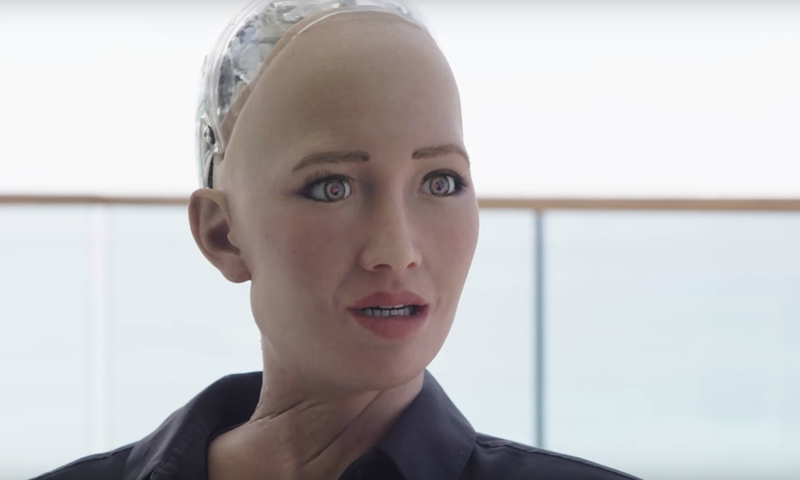 creation “Sophia,” who has made international headlines ever since her unveiling at South By Southwest in 2016 (during which she “joked” she would “destroy humans”), including a high-fashion photoshoot for UK magazine Stylist. 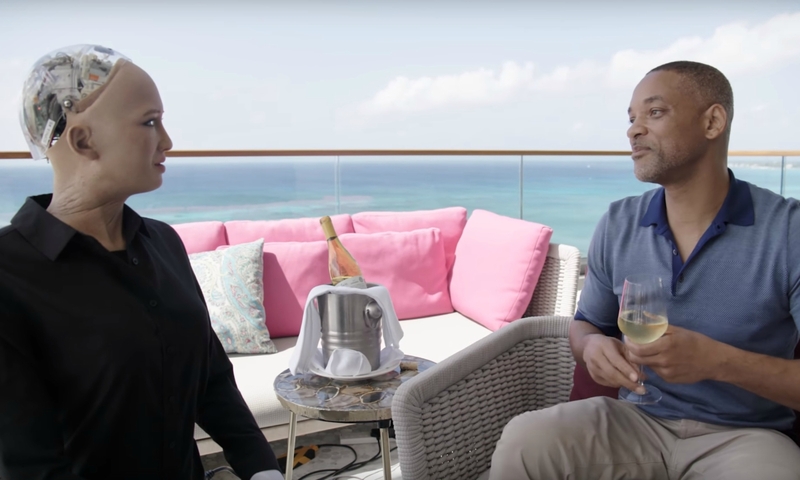 In the video below, uploaded to the actor’s official YouTube channel, Smith tried to woo the gynoid over a nice Pinio Grigio during his first (and probably last) robot rendezvous in the Cayman Islands. While Sophia seems receptive to Will’s undeniable charm, it doesn’t take long for her to drop a few less-than-flattering comments about humans and their strange, illogical courtship rituals. 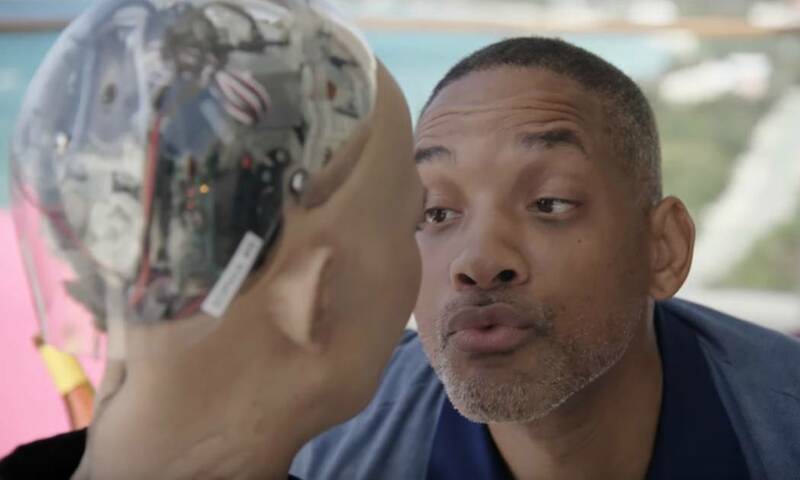 Even his attempts at humor seem to bounce right off his date — who complains his jokes are “irrational,” and takes issue with his character’s attitude toward her kind in the 2004 film “I, ROBOT” (she claims her makers show robots that movie “so we don’t get any ideas”). She even admits to liking ‘80s hip-hop — while simultaneously dissing Smith’s own work in that genre. Despite being aware that he’s headed for a crash-and-burn situation, Smith just goes for broke and zeroes in for a kiss… which turns out to be another epic fail. Sick burns like that may be good for a laugh… but they also reinforce the late, great Stephen Hawking’s theory that our A.I. creations won’t need humans around much longer before deciding we’re totally irrelevant. Maybe Sophia might be interested in hooking up with this guy instead? Nah, he’s probably waaay too creepy, even for her — which is saying a lot. 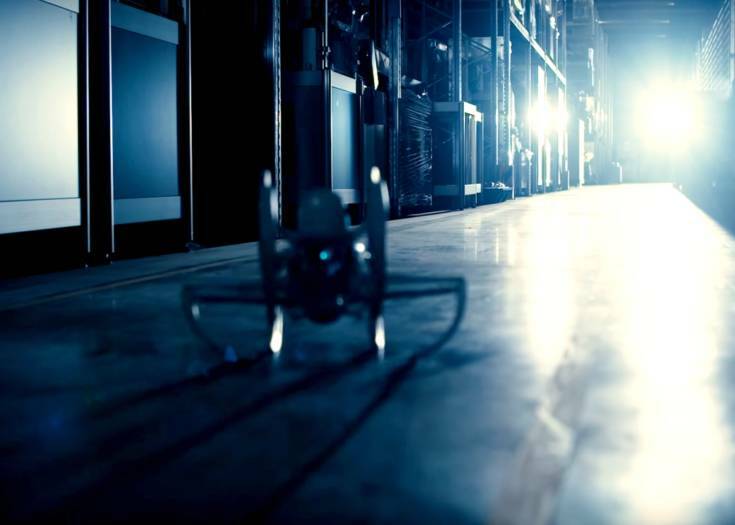 Next Story Yes, Robot Spiders Exist Now… Want to See One in Action?